Even when on holiday you can enjoy your favorite Greenland products with these handy mini packages made just for hand luggage. 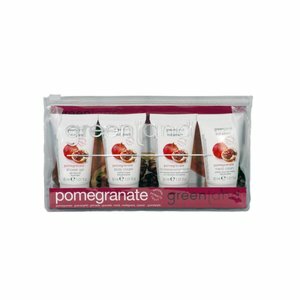 The travel kit with pomegranate fragrance contains a refreshing shower gel, 2-in-1 shampoo and conditioner, body cream and hand cream. 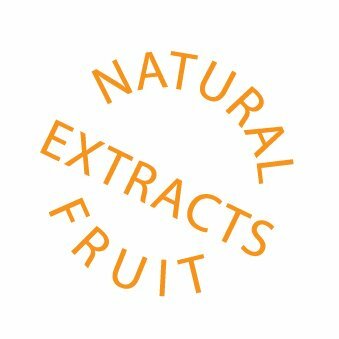 Fruit Extracts pomegranate products contain 100% natural and concentrated fruit extracts from the fruit itself. Naturally fresh! Shampoo: Moisten the hair. Split an amount of Greenland Fruit Extracts Shampoo evenly between both hands. Cover your hair evenly with the shampoo. Rub the shampoo in gently and give it a moment to be absorbed, then rinse off the hair with lukewarm water. - Shower gel: Ensure the skin is moist by showering. 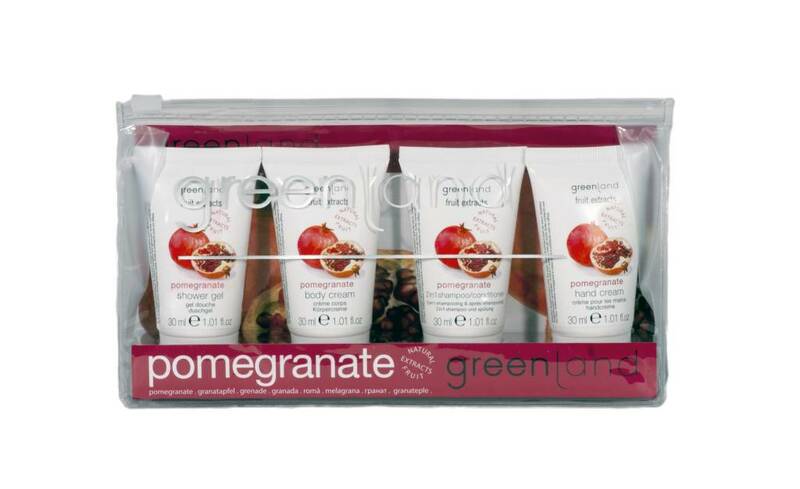 Put an amount of Greenland Fruit Extracts shower gel on your hand and soap up the entire body with the shower gel. Wait a moment for the shower gel to be absorbed and then rinse off the skin thoroughly with lukewarm water. Bodycream: Apply an amount of Greenland Fruit Extracts Body Cream to a clean skin. Spread the body cream evenly over the body and rub it in gently. Ensure that the body cream is fully absorbed by the skin. Handcream: Aqua, Paraffinum Liquidum, Cetearyl Alcohol, Glycerin, Dimethicone, Ammonium Polyacrylate, C13-C16 Isoparaffin, Laureth-30, Glyceryl Stearate, PEG-100 Stearate, Fruit Extract, Parfum (pomegranate), LIMONENE, N-HEXYL ACETATE, LONON BETA, Stearic Acid, Laureth-12, Methylisothiazolinone, Chlorophenesin, Carbomer.